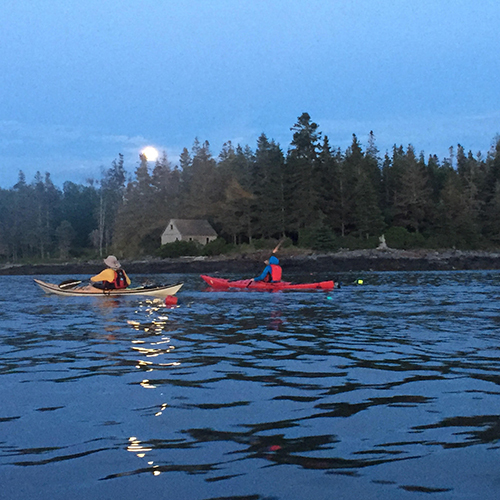 We are dedicated to providing the best sea kayak tours in Maine, with excellent service and lots of fun. Tours are offered daily and instruction is included, with all skill levels welcome. Learn more about our scheduled tours below. Custom and private tours are also available upon request. Contact us today to make your reservation. The Porpoise Tour is our most popular sea kayak adventure. We launch from Port Clyde and travel through beautiful Muscongus Bay, exploring islands, inlets, and rock formations. In the harbor we get a close view of the working fishing fleet. The famous Marshall Point Lighthouse stands in the distance. We skirt the shoreline and head away from the harbor towards Deep Cove and the Georges Islands. Ospreys and bald eagles fly overhead, while porpoises often surface feeding in our midst. We usually make an island stop and have a snack before heading back to port. Route may vary depending on weather conditions. Tours are 2.5 hours on the water, allow a half-day. Memorial Day to June 15th and after Labor Day there will be an 11am tour only Monday – Saturday and a 2pm tour on Sunday. One of the best days of my life! The porpoises, the seals, the guide…what a gift! Thank you for two great trips- the fog and sun were both beautiful! This was the most fun I have had in Maine. What an awesome way to connect with nature. We saw osprey, porpoises and harbor seals!! Thank you. Port Clyde sunsets are spectacular. We launch our kayaks in the evening and float peacefully as the sky transforms into a pallet of beautiful colors. Time varies depending on the date, please contact us for more information. Offered on Sunday Evenings. Paddle into the setting sun and watch the moon rise out of the ocean. A very special experience! Call for dates and times. Amazing moonlight paddle. The highlight of our honeymoon. Hope to see you on future anniversary trips to Maine. On the new moon July, August, and September experience Bioluminescence and stargazing as we paddle along the islands around Port Clyde. Call for dates and times. We need a credit card to hold a reservation. We require 24 hours notice to cancel a tour, and 96 hours for rentals. Anything less will be charged 50%. Our trips run fog, rain or shine. For obvious reasons, we can not guarantee perfect weather. We will not take clients out in dangerous conditions. Port Clyde Kayaks will not refund for cancellations made by participants due to perceived inclement weather. However, if Port Clyde Kayaks cancels a trip due to unsafe weather conditions, you will receive a full refund or have the option to reschedule.